While the prospect of porting new applications in the cloud gets lots of airtime, legacy apps in the cloud may provide major ROI. Business continuity may be taking on a new flavor as the cloud gains prominence. Application resiliency is key to building an elastic infrastructure. As archiving needs grow, IT teams are trying to figure out whether it’s time to ditch tape and move to cloud archiving services. Amazon has waded into the market with its Glacier service. The fall of 2012 saw a new crop of mobile devices hitting the market—which means IT teams have new devices and operating systems to look out for. 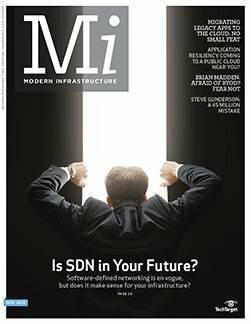 Get a look inside the November issue of Modern Infrastructure with this introduction from editor-in-chief Alex Barrett. IT teams might be nervous about BYOD security issues, but there’s no need to be, according to Brian Madden. Securing devices isn’t any different from what IT has been doing for years. Social media in the data center may not be far off, as vendors and emerging technology trends point to increasing use of social networking in the enterprise.